Put on your gloves and, with sharp scissors, cut a 1-inch wide strip out of the aluminum lasagna pan. The strip should be 12 inches long. 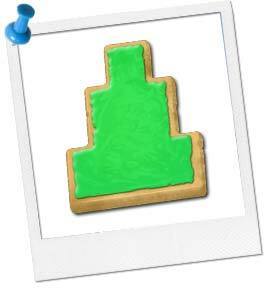 Using our Emerald City cookie cutter template as your guide, carefully bend the aluminum along the dotted lines. Make sure to crease the strip at each corner so the shape forms correctly. Staple the ends of the aluminum strip together 3 times so that the shape stays in place. File down any sharp edges of metal. Now prepare bake the cookies using our Sugar Cookie recipe using your new Emerald City cookie cutters! Make or buy your own white frosting or use our Royal Frosting recipe. Add 10-15 drops of green food coloring to create emerald green frosting. Frost the cookies and serve!